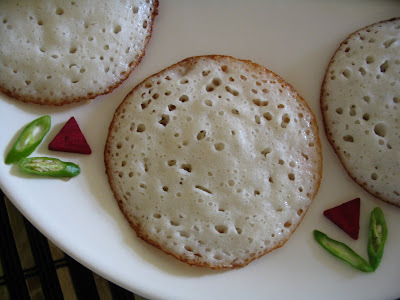 I know many of us have left over rice everyday or at least 4 days a week instead of throwing it just use for making these type of dosas, are the idli which I posted earlier really they taste so yummy. Today I am posting Annam dosa (Rice dosa) which will be so tasty with any spicy chutnies since this dosa has no spices, it suits with sambar, gravies(kurma), chutneys. Today I am posting 2 variation in this dosa another one I will post later. Coming to the Beets chutney so healthy tastes yummy too.. Try it out and let me know. 1. Soak the rice, dhal and fenu greek for few hours and grind along with leftover rice to smooth batter. 2. Ferment it overnight . The consistency should be slightly looser than normal dosa batter. 3. Heat the skillet. Add the ladle full of batter and add tsp of oil all around and close with lide. 4. Once the upper part is cooked and down part gets crispy remove from the skillet and serve with any favourite chutnies. 5. Even you can flip it over and make crispy dosas too. 6. Dosas can be made thinner and crispier too. Do according to your wish. 1. Mix everything with the batter and make crispy dosas. 1. Heat oil in a frying pan and add all the ingredients(beets,green chilli and garlic) saute until they change slight brown color. 2. Grind to fine paste adding salt and tamarind. 3. Season with mustard, urad dhal and curry leaves. Add the ground paste and cook for few seconds and transfer to the serving bowl. 1. For idli or these types of dosas make this chutney little spicy. 2. Beets can be substituted by carrot too. But add red chilli for carrot chutney. 3. Add onion while frying beets for another variation. Looks very interesting. Beautiful presentation with cute beet pieces and green chillies. Beet chutney is new, have made carrot but not tried with beets. Just one clarification, should the left over rice be grinded as well left for fermentation? wow! these pics are a sure treat! they looks so spongy crisp! Wow awesome dosas. I love dosai very much. Yesterday only I finished my dosai batter so I will try soon. and the decor is good.. Your Dosas looks so cute that i feel like grabbing some from the screen..tempting. I have some in my drafts too,with slight difference. and that upma is prepared by me dear..Next time I will try taking a snap when he prepares and add that too..
Hey why dont you remove that word verification for posting comments?? Wow spongy soft dosas! The chutney looks delicious too! How do you manage every time to present so nicely pavi? Pls tell me your creative secrets!! Great presentation. Nice way to use up left over rice. I too have the same doubt asked by A2Zveg. Beet chutney is interesting. Have tasted in restaurants, but never made it at home. Thanks for the recipe. wonderful way of using the rice for batter ...the dosas look yummm. nice presentation as always and nice clicks. Loved the beetroot chutney, sounds delicious and of course lovely presentation! Cute dosaas and chutney sounds so innovative! Wonderful dosas. Chutney looks yummy. Nice presentation. Beautiful presentation of dosas and chutney! beetroot chutney is new to me... sounds tasty! Thanks for stopping by my blog ...Hope to see you again theer . 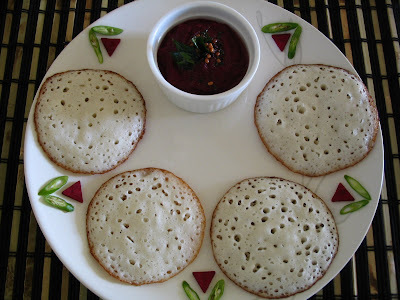 Love the dosa recipe .. Small dosa's looks so cute..
love the mini dosas.It tastes great with beet chutney. Ur place always reminds me of the hustling bustling sukh sagar and shiv sagars back in India. U make all sorts of dosa's and I cannot make a simple dosa without sticking half of it on the non stick tava :( Must come and learn from you. Great clicks and happy weekend to u!! Wowoww cute dosa! 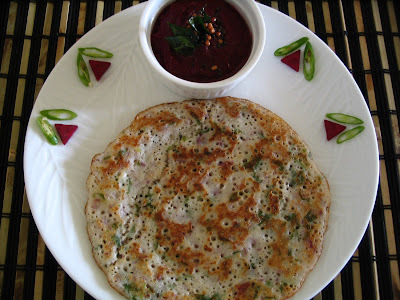 !looks yum..am ready to finish those cute dosas with beets chutney rite now! 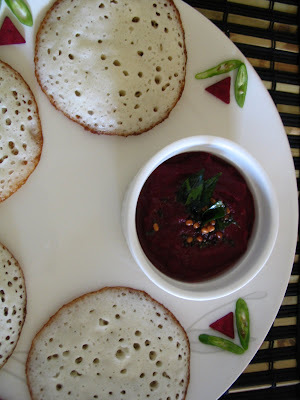 Rice Dosas and Beets chutney, Not only they look yummy yum also very different recipe too. Hats off to u for familiarising me with such unique recipes Pavi..
Wow, what a colour, yummy dosas..! the dosa look so cute...like the small holes in them :-) One question though when do you add the cooked rice to the batter? Wonderful presentation! !...liked all the dishes...pics...gr8! great way to use up leftover rice...beet chutney is new to me, sounds very interesting!! Love beets and photo looks delicious. nice blog you have here..
WHat a wonderful way to use the leftover rice..Mini dosas look yumm!! 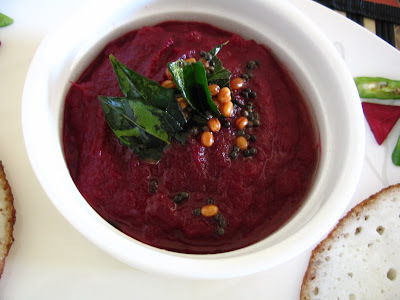 Cant wait to try this dosa with the beets.Looks very appetizing..
Wow nice one. beautiful beautiful presentation. 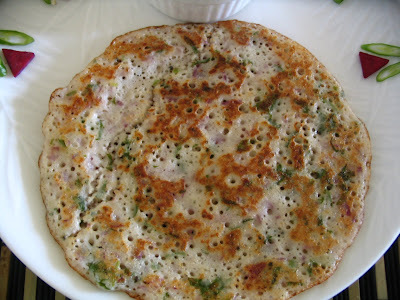 Rice dosa are just wonderful...will try next time when I have rice left..
delicious looking, and making me fell hungry! I hate left over rice - and I think this is a great idea of having breakfast and getting rid of left over rice as well! I am a first time visitor to your blog. Your photos look beautiful and you do have a wonderful talent at presenting every dish. Keep up the good work! Thanks for the recipe. One suggestion - Its little difficult to read the light pink font. Go dark.